I came across this book while listening to a podcast called TWiT (This Week in Tech), which was talking about an article on Farmville, which referenced Man, Play and Games by Roger Caillois in talking about what makes a game. It sounded like an interesting book, and I was pleased to find it pretty good. Caillois starts out defining what play is and then takes on the task of classifying each type of play. 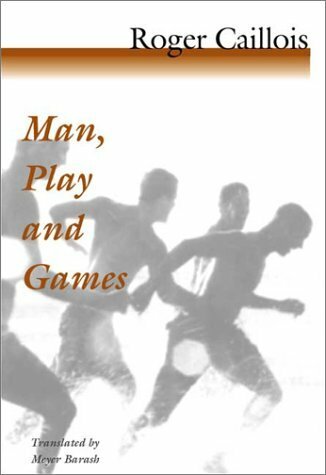 One of the funny parts about the book is that Caillois keeps talking about how difficult it is to do given the nature of play and games. Check out the quote below to see what I mean. Another interesting thing about this book is the language used. Caillois was a French professor, and therefore wrote the book in French; then it was translated by Meyer Barash who was also a university professor. As a result, the language used is very formal. I found myself having to take my time to reading and had to take a break after a few pages to digest what I just read. I'd like to share a small excerpt to demonstrate the type of language used. This is the first paragraph of the second chapter. Free: you don't have to play if you don't want to. Separate: has limits of space and time which are defined and fixed in advanced. Uncertain: the outcome is unknown, nor can it be known. Plus the player has some room to make decisions which affect the outcome. Unproductive: Does not create goods, or wealth. At most an exchange of property, but the net impact is zero. Governed by rules: worldly rules are suspended and a new set of rules are followed. Make-believe: an awareness that you're in a type of second reality; not "real life". Competition: Games that require skill. You are dependent on your own ability to compete. An example might be a push-up contest, or a 100m dash. Chance: The opposite of competition. Instead, you depend fully on the fates. Examples, include anything that uses a coin flip or dice roll. Simulation: Games where you are pretending to be something other than yourself. The theater is all about simulation. Vertigo: These are games, or activities, that give you some sort of rush, or in some way change your mental state. Riding roller-coasters, spinning in circles, and even drinking alcohol are this type of game. It starts off with chance, the coin flip, to see who gets the ball first. Then the competition for the players begins: It depends on who calls the better plays and executes the strategy better. For the crowd, it's a simulation as they're watching people dressed up perform on the field. There might be side bets, chance, going on too. They themselves might even be dressed up. The players and the crowd might also experience vertigo: The crowd by shouting and drinking. The players by taking and giving big hits. Callois finishes up the book talking about different cultures and how the type of play in that culture influences it. I honestly didn't find this section as interesting. I was more interested in the games themselves and how they were thought of. Overall, I found this a fun book to read. The language was a challenge, but the ideas were solid. I really enjoyed thinking about the different aspects of games and play. At the very least, it has given me a new framework to talk about and evaluate games. I've also learned more about my preferences, and can better articulate them now: For example, I prefer games of competition over chance. I also like games where the odds, the uncertainty, is fairly even. If the chances of me winning are low, I don't enjoy it as much. Should you read this book? Probably not. It's really for the person who is into gaming, and more importantly, into understanding how games work. Game developers must read this book; casual gamers don't need to bother.